What happens if the target is higher or lower than you? 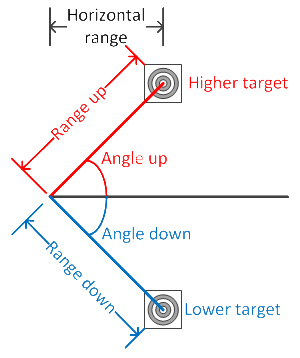 Whether the target is higher of lower, the basic principle is the same. First estimate the range to the target, using known techniques. !!! Do not to use the target height! Use the target width !!! Viewed at an angle, the height will appear less than it actually is!!! Then multiply the range to the target with the cosine of the angle. This will give you the horizontal range. The horizontal range is the one you set your scope elevation to. Note: the results for 15° up or 15° down are the same. cos(15) = cos(-15). The horizontal range is the same. Note: Angle 1 is equal to - Angle 2 and the horizontal range is the same. Set your scope for a range of 241 yards, aim, send it! Many accessories exist, like the angle cosine indicator. You could also build one using a plastic protractor and string. I use my compass. The spotter can measure the angle like shown in the picture. This compass incorporates a small black arrow that always points down when the compass is turned to the vertical. That arrow is not affected by magnetism, only by gravity. It is called a clinometer. The angle can be read using the degrees dial. Set the dial due West (or due east, depending on which side you want "down" to be). 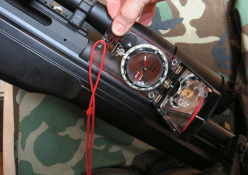 To measure the angle, simply read the dial using the small black arrow. It is a Suunto MC-2. There are other methods to accomplish the same result. If you know the bullet drop difference for the angle of your target, you can hold or compensate on your scope for that amount. Tables with that data exist. There are also a number of quick fixes.